Black pepper of commerce is produced from whole, unripe but fully developed berries. The harvested berries are piled up in a heap to initiate browning. Then they are spread on the suitable drying floor after detaching the berries from the stalk by threshing. During sun drying, berries are raked to ensure uniform colour and to avoid mould development. Drying the berries for 3-5 days reduces the moisture content to 10-12 percent. The dried berries are garbled, graded and packed in double lined gunny bags. Blanching the berries in boiling water for one minute prior to sun drying accelerates the browning process as well as the rate of drying. It also gives a uniform lustrous black colour to the finished product and prevents mouldiness of berries. But prolonged blanching should be avoided since it can deactivate the enzymes responsible for browning process. White pepper is prepared from ripe berries or by decorticating black pepper. Bright red berries, after harvest are detached from the stalk and packed in gunny bags. The bags are allowed to soak in slow running water for about one week during which bacterial rotting occurs and pericarp gets loosened. Then the berries are trampled under feet to remove any adhering pericarp, washed in water and then sun dried to reduce the moisture content to 10-12 per cent and to achieve a cream or white colour. White pepper is garbled, sorted and packed in gunny bags. Approximately 25 kg white pepper is obtained from 100 kg ripe berries. Fully mature but unripe berries are harvested and boiled in water for 10-15 minutes to soften the pericarp. After cooling, the skin is rubbed off either mechanically or manually, washed and sun dried to obtain white pepper. Since no retting operation is involved, the product will be free from any unpleasant odour. However, white pepper produced by this method gives pepper powder of light brown colour due to gelatinisation of starch in contrast to pure white powder obtained by traditional method. Dehydrated green pepper is a premium quality pepper, processed out of farm fresh green pepper berries into dried form, by air drying, retaining its green colour and giving out the best flavour. This is par excellent in quality, flavour, colour etc than black pepper. This value added spice product is based on technology developed by the CFTRI India. The processing involves collection of farm fresh berries right from the pepper vines and directly feeding them to the processing plant within 24 hours, before any microbial action sets in. The product, dehydrated green pepper is a substitute for canned green pepper. Dehydrated green pepper is easy to store and transport, when soaked in lukewarm water will regain its fresh green colour and shape. Because of its pleasing flavour and aroma there is a distinct preference among conscious consumers for green pepper to black pepper. The processing of dehydrated green pepper is carried on a seasonal basis, depending on the harvesting period of raw green pepper crop. Usually the season for raw green pepper cropping starts from October, November and ends by March, April. Dry recovery comes to 20%. The pungent taste and flavour of dehydrated green pepper is universally liked, in meat and sausage industries. The packers sell it in small packets as well as in powder form. Beef and pork steaks become more delicious with a sprinkling of green ground pepper. Dehydrated green pepper gives attractive colour, flavour and aroma to all kind of soups. Major applications of green pepper in brine are in making sauces, meat processing industries, steak preparations and in the food service sector. The uniform tender berries that pass the quality control measures are washed and cleaned and put in to a brine solution. The cleaned berries are stored in 17% ± 2% salt solution and vinegar around 0.6% ± 2%. This is washed three times in 45 days and each time changing the brine solutions, so that they are properly matured and then packed in high density poly ethylene (HDPE) food grade cans or as required. India is one of the very few countries, which produces and supply freeze dried green peppercorns, wherein even the natural form of the green peppercorns is retained. This is a specialty product, which finds a wide application in instant soups and dry-meals on account of its special characteristics and subtle flavor. It is also used in the cheese industry and for preparation of pates. By virtue of its reconstitution characteristics it is a favorite choice for housewives who obtain it from the retail in glass jars for varied application at home.Most of the moisture from fresh tender green pepper is removed by freezing the berries at -30ºC to -40ºC under high vacuum. The colour, aroma and texture of freeze-dried green pepper are superior to sun dried or mechanically dehydrated green pepper. Freeze-dried green pepper has 2-4 per cent moisture and is very light. Dehydrated salted green pepper is a product developed by the Pepper India Corporation; it is a 100% substitute for green pepper in brine and is much more convenient as it is easier for transportation and storing as it does not involve any brine solution. It is a product, which can be used instead of pepper in brine as it contains both pepper and salt in the same proportion and at the same time maintains the natural green colour. Green pepper after harvest is preserved in 2% brine solution and the product is heat sterilized. This product has the additional advantage over dehydrated green pepper in that it retains the natural colour, texture and flavour. Green pepper is preserved without spoilage in 20% brine solution containing 100 ppm SO2 and 0.2% citric acid. Addition of citric acid prevents blackening of berries. To overcome the disadvantages of poor texture and weak flavour of dehydrated green pepper and the high unit weight and packing cost of canned and bottled green pepper, cured green pepper has been developed. Berries are thoroughly cleaned in water, steeped in saturated brine solution for 2-3 months, drained and packed in suitable flexible polyethylene pouches. Sterilized black pepper is a premium quality pepper. It is more noble and aromatic than the other species of pepper. Being the spice capital of India, Kerala is considered as the custodian of these ‘Black Pearls'. 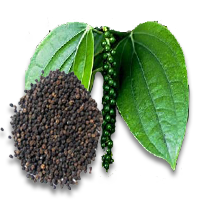 Black pepper is native to Malabar and has been grown here for more than 2000 years. Pepper berries are collected farm fresh and after removing all stones and other foreign particles, it is thoroughly washed in boiling water and dried under controlled conditions, till the moisture is brought down to less than 11%. Packaging is done using double-layered poly bags of 25 kg net weight. Special quality black pepper is crushed and sieved into various sizes varying from 10-30 mesh according to the choice of the buyers and packed in double lined polybags of 25 kg each. This is a form of white pepper produced by mechanical decortications of the outer skin of black pepper. This is generally done when white pepper is in short supply. The appearance of decorticated kernel is inferior to traditionally prepared white pepper, but is satisfactory when ground. Also the milling operation requires considerable skill to avoid excessive volatile oil loss. Black pepper is crushed to coarse powder and steam distilled to obtain 2.5 to 3.5 per cent colourless to pale green essential oil which becomes viscous on ageing. It is used in perfumery and in flavouring. Oil can also be distilled from white pepper but high price of white pepper and low oil yield do not favour its commercial production. Extraction of black pepper with organic solvents like acetone, ethanol or dichloro-ethane provides 10-13% oleoresin possessing the odour, flavour and pungent principles of the spice. The content of the pungent alkaloid piperine ranges from 4 to 6% in dry pepper and 35 to 50% in oleoresin. When freshly made, pepper oleoresin is a dark green, viscous, heavy liquid with a strong aroma. One kg of oleoresin when dispersed on an inert base can replace 15 to 20 kg of spice for flavouring purpose.